The overall construction of the LED will last a long time. Electronic Message Centers (EMC’s) are constructed with industrial grade aluminum extrusion. Each display is weather-sealed so it can endure any type of precipitation. Heat is the number one enemy of LED displays, and the biggest factor influencing how long the LED sign lasts. Proper venting during the installation process combined with temperature sensor fans within the display will increase the lifetime of the LED. 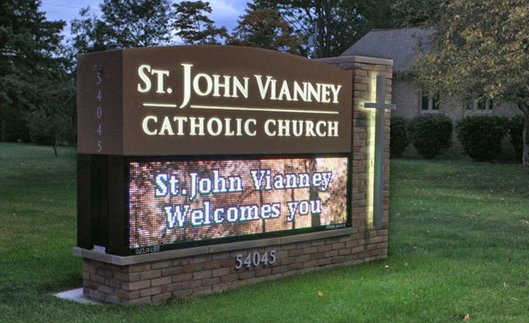 LED signs require minimal maintenance, if at all. With different weather conditions across the country, these displays are made to endure. Rain or snow will actually help to clean the display from any dirt or grass clippings that may accumulate on the display or exterior. You also have to consider the actual LED tiles that ultimately display your content or messages. LED displays can last 100,000 hours or anywhere from 10-11 years. This is calculated using the message center 24 hours a day, 7 days a week. Utilizing the display within normal business hours will extend its lifetime. LEDs use red, green and blue, but they are capable of producing a variety of colors. The colors used in the sign will also affect how long the LED sign lasts. To produce a white background or lettering, the red, green, and blue LEDs are working at full power. Since other colors require less power, using less white in your LED sign content will extend how long your LED lasts. So how long do LED signs really last? Your outdoor LED sign will last about 100,000 hours, that’s at least 10 to 11 years, but you can make it last even longer. With proper maintenance, proper installation, a little time off and careful color selection, you can make your sign last up to 15 years or more.